December 27, 2016, 4:04 PM · To be honest, I did not listen to old recordings of Jascha Heifetz when I was a young child. I had no idea who he was. My introduction to the orchestra was through those shimmering overtures. The violin parts were executed with great schmaltz -- warbly vibrato, glissandi, soaring descants. When I listen again, it's not hard to detect the imperfections. A number of those recordings are live, and they just didn't have the ability to go back and fix every minute mistake in post-production. But the lack of perfection never mattered to me. I loved the sound of the violins, and I loved the songs, cheesy as they were. That music rang in my head throughout my early childhood, and I went to every movie musical possible, as well as a few live productions. People tend not to break into song and dance in the movies these days. It's been out-of-fashion for a long time, with the occasional exception. In popular culture, synthesized sound and computer-generated effects dominate the scene. I've casually grown used to a scrubbed-clean aesthetic of 21st century, with its pitch-corrected, over-produced music and its color-corrected, over-edited shows. It's just part of the cultural landscape; I barely notice it any more. So I found myself a little disoriented last week, when I saw the new movie La La Land. I assumed that the movie would be about Los Angeles ("LA") and indeed the city was almost a character in the plot. But the movie is not as much about the city as it is about a land of music -- "la la" -- and being an artist. In fact, the movie is a musical, a lavish, over-the-top musical that seems to spare no expense or detail. The music is acoustic (but for the very intentional and hilarious synth that represents one character's departure from his dreams), made by hundreds of musicians on violins and trumpets and actual drumsets and imperfectly wobbly human voices. There is dancing, well-timed and upbeat, though I don't know if it would even win a passable score on "Dancing with the Stars." It didn't matter. It has what one might call "high production values," and yet at the core of it is something very human and not exactly perfect - yet beautiful nonetheless. I actually found myself bursting into tears again and again. Why? I can tell you it had little to do with the plot, which was a boilerplate romance, probably intentionally so. I was more moved by the idea that I found myself watching a musical -- a brand-new musical, written by a pair of 31-year-olds. The new generation is writing musicals! I found out later they shot the entire thing on film, too -- not the digital video cameras so often used in movie production today. You certainly can pick apart the plot of this movie. (You can nearly always pick apart the plot of a musical or opera.) I'd argue the plot is beside the point. The point is revealed early in the movie, in something the main character says about the art he loves, jazz: "They always say, 'Let it die.' Not on my watch." Jazz is just one of many things that seem imperiled by the current culture; one could substitute in a whole list of others: the musical, classical music, film photography, dance, human art. And yet there are people who would make a movie like "La La Land," people who don't want to "let it die." They live with a burning passion to see that music lives, that art lives, that cinema lives. 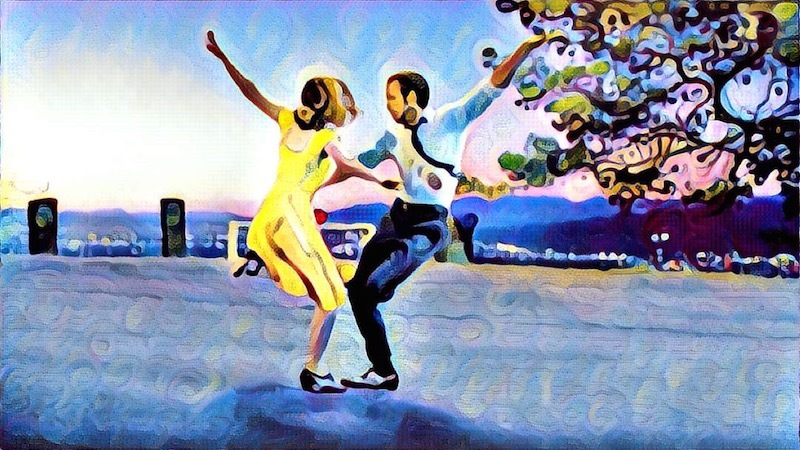 In an era of technology, "La La Land" made me feel for a few hours that the human spirit is alive and well, and ready to take on those forces that would strip us of our humanity. December 28, 2016 at 02:54 PM · I enjoyed the movie and its use of music to tell the story. It's definitely something you want check out on the big screen to get the full impact. I wondered if the opening number was filmed on an actual freeway in LA. That was a really cool idea. December 28, 2016 at 05:33 PM · It was, Raymond! They actually closed down a major freeway ramp for two days to film that dance number! It is actually a really, really high ramp. I sometimes drive over it when coming home from the airport, and it's even a little scary driving. Hard to imagine leaping off cars! December 28, 2016 at 07:04 PM · Excellent article, Laurie. I can tell you as a performer myself who has done both film and stage (albeit just locally) that I think the main issue with movie musicals is that "East Coast, West Coast" mentality. Broadway is the keeper of the American Musical and Legitimate Stage, and Hollywood makes Movies and T.V, and they are on opposite coasts. Even the Unions are on opposite coasts, with Actors Equity (stage) located in New York, and SAG (film & tv) headquartered in L.A. So you have two different cities with two different industries and cultures, who are competitive and really don't like each other. The English have it a lot better, imo, in that their center of entertainment is London. There, creatives can explore the full range of their abilities without "picking a side", so to speak. Whew, that should have been it's own post! Happy New Year! Cheers. December 29, 2016 at 03:35 AM · The great songwriters of musicals for stage or screen, such as Irving Berlin, Hoagy Carmichael, Richard Rodgers, George Gershwin and Leonard Bernstein, to name just a few, have provided us with the raw material that the cultural treasure of Jazz is based upon. So it's as great a tradition as any, I think. January 3, 2017 at 05:32 PM · Back in high school I made all my spending money playing in pit orchestras for community theater productions of all the old broadway musicals. I've played many of them! Lots of fun. Got to meet a lot of really cool people. January 3, 2017 at 06:37 PM · I hope they create a version of this one that high schools can perform, with a pit orchestra of course!